Our first harvest was a great success!! All the frames in the super were laden with honey and were well capped, so we removed two of the centre frames for harvesting. 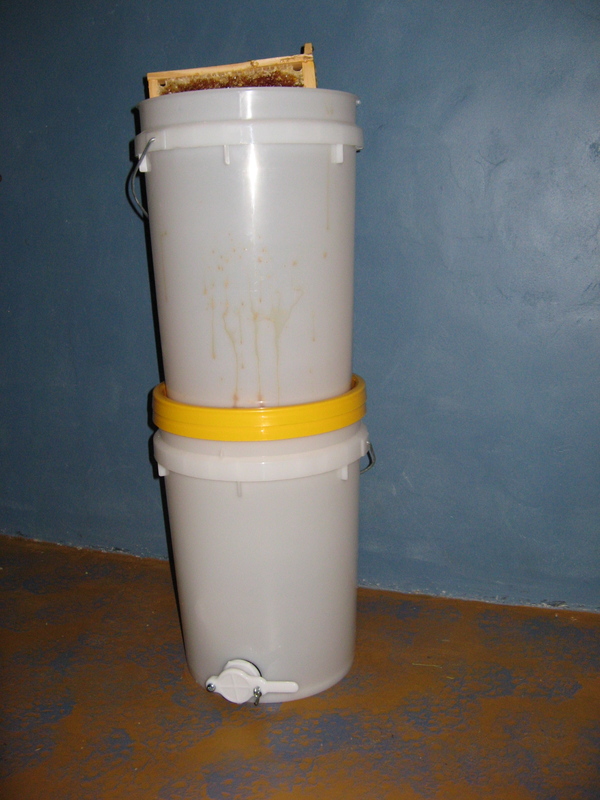 We used a very simple drainage system- the top bucket has a large hole through which the honey drains through a filter and into the bottom bucket which has a tap in the bottom. 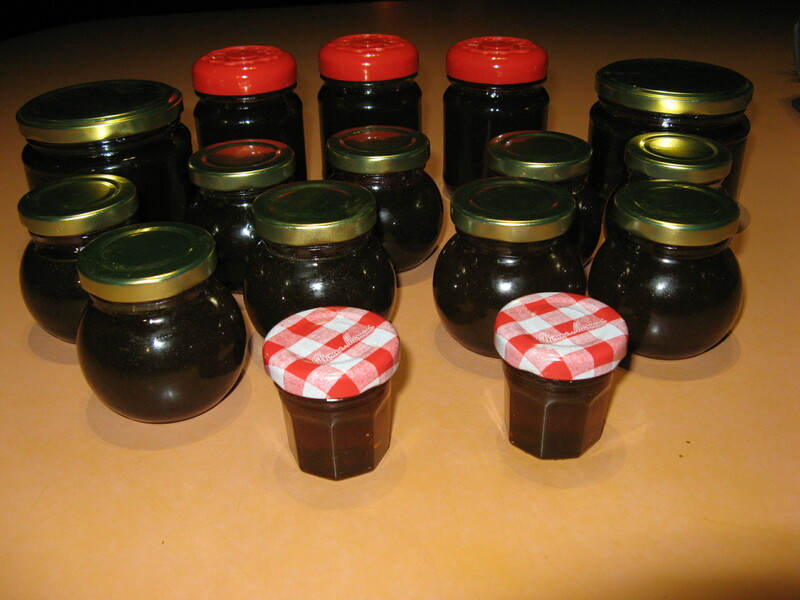 After scraping the capping off, we let the honey drain for at least 24 hours, then poured it into jars. These first two frames gave us 2.3 litres of honey! 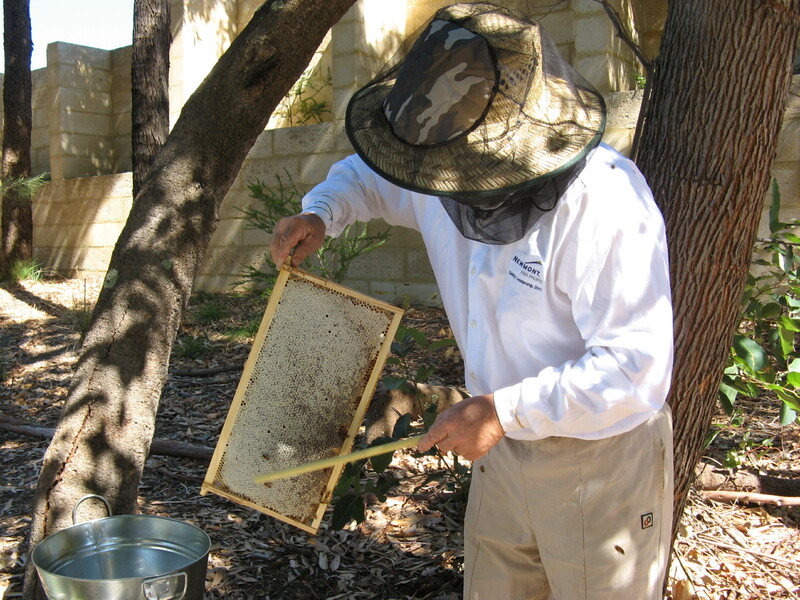 Once each frame had drained, we returned it to the super for the bees to tidy and rebuild! As our super was so full of honey, we also added an empty super for them to move in to. 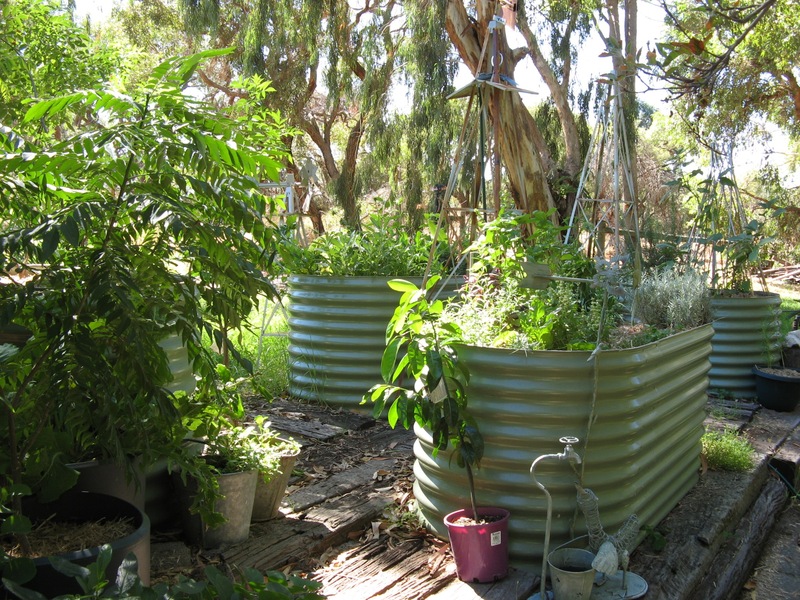 After the continuous heat of a Perth summer, we are now enjoying ideal growing conditions! We have had a bit of rain, plenty of sunshine, and reasonable temperatures, so everything is growing well. The herb garden is looking great- partly due to the weather and partly due to attaching a sprinkler to the top of a windmill stand so they could be cooled down more easily. Herb garden with sprinkler on top of the windmill stand! This area has been so successful, our next ‘project’ (there is never nothing to do!) is to bring the pumpkin palace and two large raised beds to this area too. This is for a number of reasons-the raised beds are certainly successful; being near the back door is also beneficial; the area currently being used will revert to a ‘clucker tucker’ (poultry food) area for the poultry to get a good source of greens without damaging the paddocks too much; and concentrating the vegetable growing areas really just makes managing it all much easier! 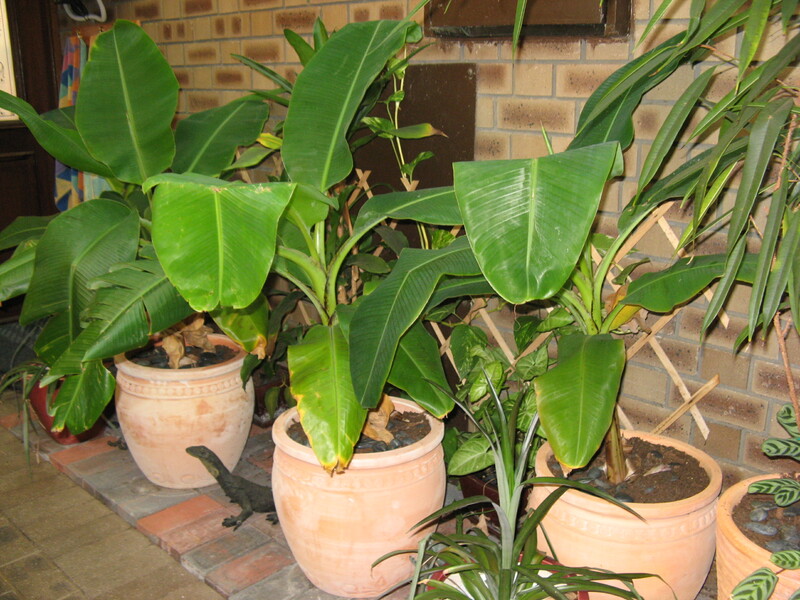 Also growing particularly well are the bananas in the atrium! It will be interesting to see how they go over winter, as it does get quite chilly in there, but they have grown amazingly over summer! Well, it has certainly been a hot summer here in Perth, but despite this we have had an abundance of some vegetables! 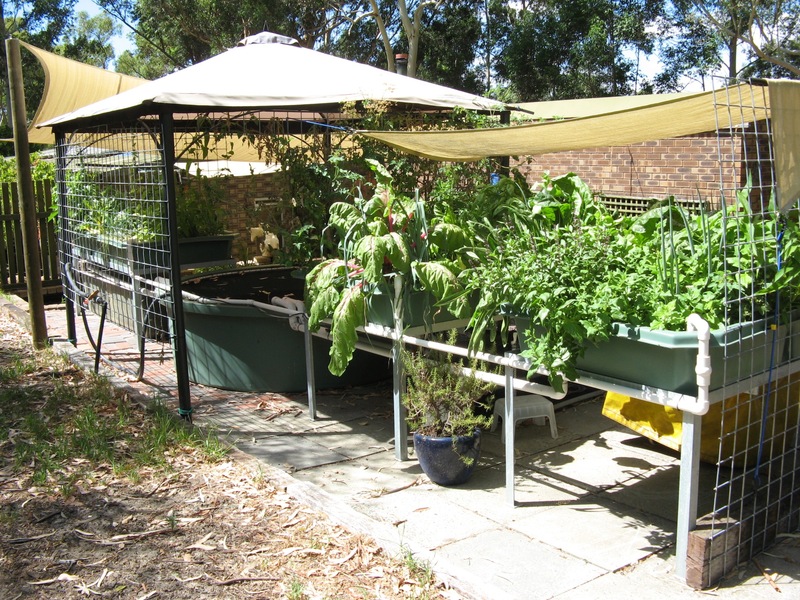 The aquaponics system is amazing…a couple of shade sails over the top to protect from the overhead sun, and there has been incredible growth in comparison to the dirt garden. Although some of the veggies exposed to the sun, like the rainbow chard, wilt by the end of the day, they perk up beautifully and keep us well supplied! Warrigal (Botany Bay Greens or New Zealand Spinach) has been a prolific grower all through summer. 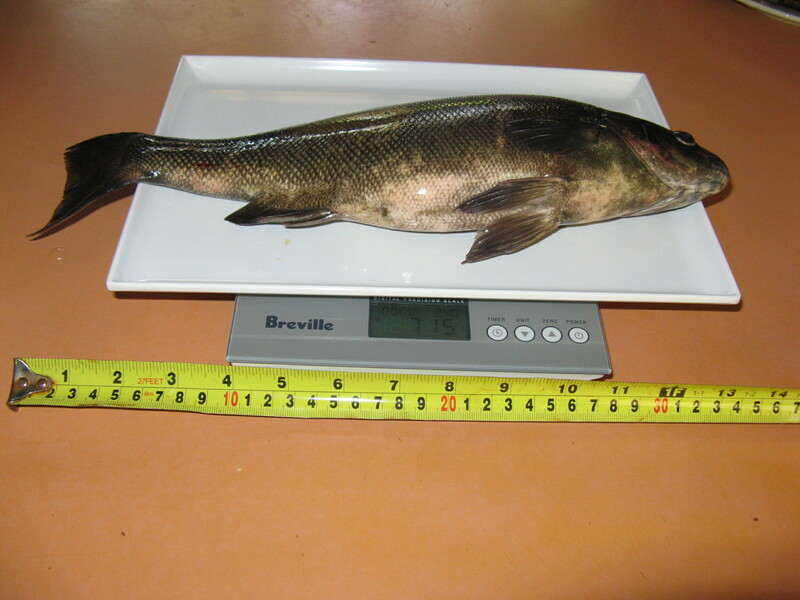 The barramundi in the aquaponics system fish tank are growing well, though we haven’t caught any yet. We have had a few silver perch from the swimming pool though! 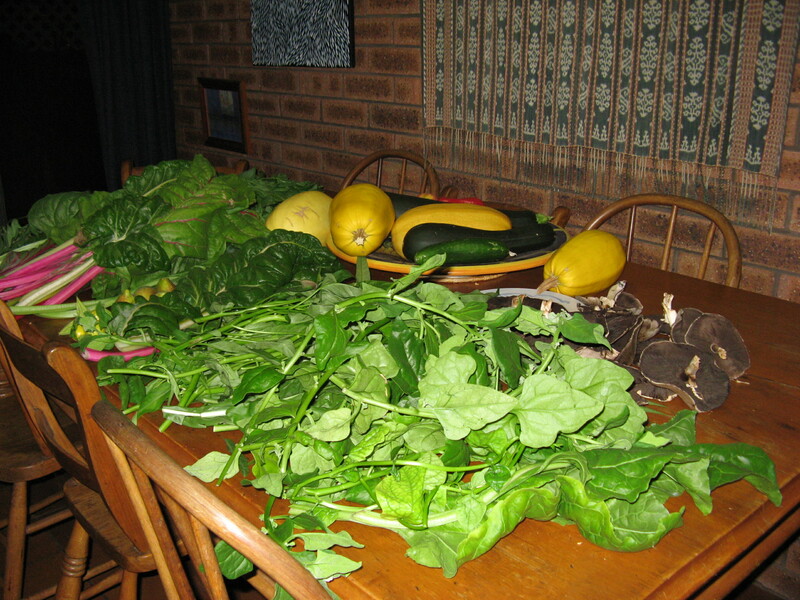 This is the pickings from just one day….rainbow chard, silver beet, perpetual spinach, warrigal, basil, kang kong, malabar spinach, and spring onions are all from the aquaponics system. Zucchini, cucumber, and spaghetti squash are from our ‘Pumpkin Palace’, and the mushrooms were growing in the paddock and were too good to overlook! 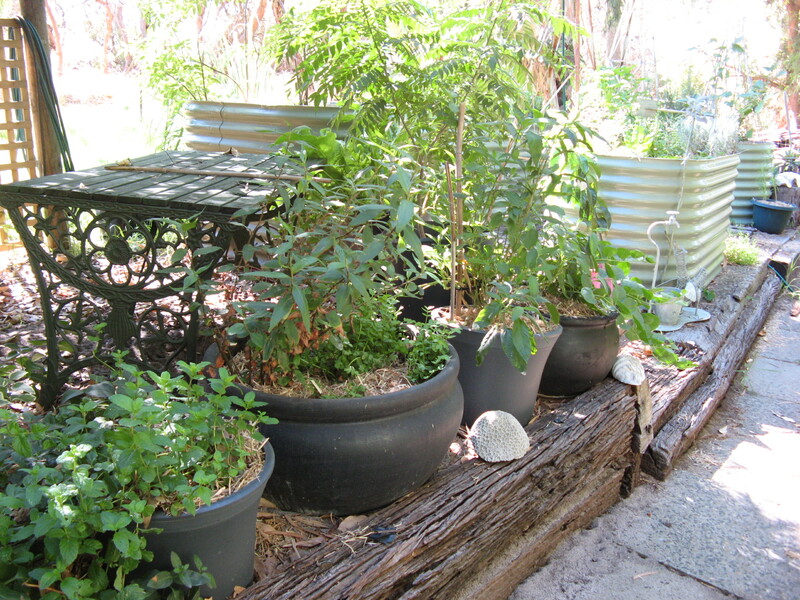 There are also figs, chilli, tomato and capsicum in amongst the green! 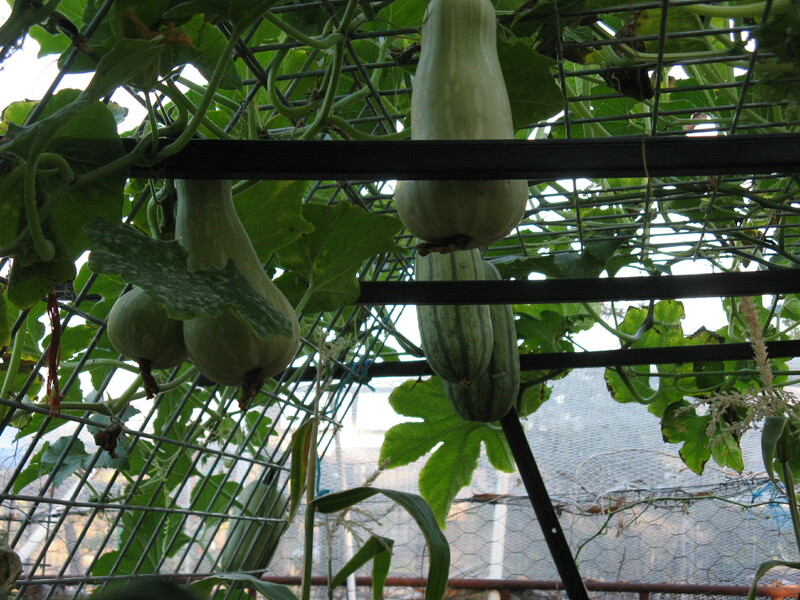 Pumpkin Palace is covered in butternut and delicata pumpkin, cucumber, spaghetti squash and the beginnings of luffa!